Holiday trips are being taken more than ever in the past few years, travelling is no longer considered to be a form of self-indulgence. Travelling abroad used to be a luxury that we would all look forward to once or twice a year in the past. With the rise in standards of living and the mainstream trend, people would rather splurge on travelling than owning a luxury good. When it comes to travelling, it is always better to travel with an ease of mind. What better than to accompany your air ticket bookings along with a travel insurance to ensure adequate coverage for your holiday trips. As with any other insurance policy, insurers have now given their policyholders the flexibility to opt for either a single trip policy or an annual trip policy. Learn more about purchasing right Travel insurance in Singapore now. 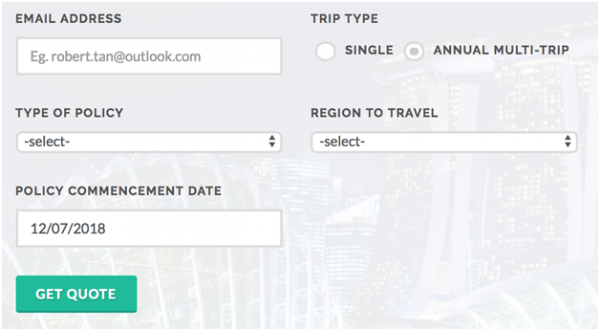 Single trip policies are pretty self-explanatory. You purchase a one off travel insurance for that designated country that you are travelling to, and the premium of the policy is one off, but subjected to the total duration and how much coverage you would need for yourself. What should be taken into serious consideration is that not all travel insurance offer by various insurance companies are the same. 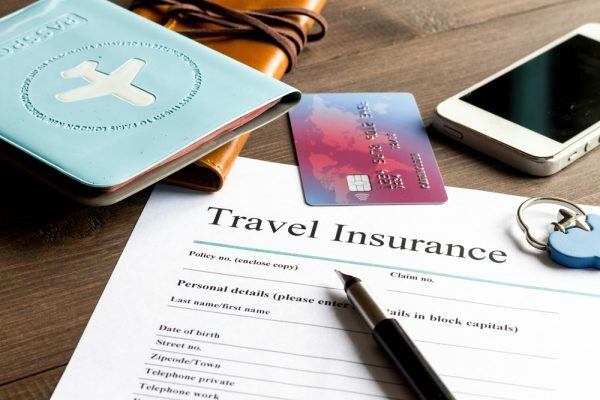 In order to stand out and differentiate themselves, insurance companies design their travel policies to what they deem travellers would need. Hence, it is always good to make a couple of comparisons before purchasing a single trip travel policy. Within the context of a single trip travel insurance, some insurers are also offering premium and basic coverages which simply differentiates the extent of your coverage. By topping up an x amount on top of the regular premium, one would be able to enjoy a wider coverage. It’s like topping up a fee when you book a regular suite to enjoy an upgrade of your hotel room. Disclaimer: I would like to emphasise again that no one travel insurance is designed the same as there are several insurers offering travel insurances which provides policyholders the choice to choose which would be a good fit for them. By making use of comparison websites such as Comparekaki, you will do yourself a favour and save up so much of your time as compared to enquiring from individual insurers, jotting down the coverage and other details provided. With such sites, comparison is made easy as you are able to view from the available travel insurance providers and their details, all at a glance! Say for instance, If you are planning to visit Thailand from the 12th of July 2018 till the 29 July 2018 for approximately two weeks, you can simply key in the details required and you will be able to get a quote as quickly as 5 minutes! At a glance, you will be able to see all essential information that you will need to know regarding the various available policies which will cover you for your holiday trip which will likely consist of a shopping spree and enjoying the exquisite and authentic thai food. 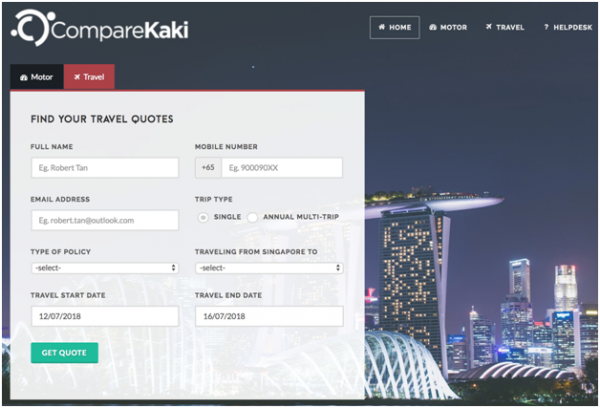 Comparekaki has a wide number of partners offering travel policies that you can compare, such as Etiqa, AIA, NTUC Income, Great Eastern and many more. But when it comes to the annual trip travel insurance, you will only be asked for the start date where you wish to be covered and you will automatically covered through the year. For frequent travellers who travel almost every couple of months, an annual travel insurance plan would be the ideal essential policy for you. Besides saving you the hassle to keep going back to your insurance company, you are able to make changes to your flight dates as and when without having to make modifications to the policy at all. Most annual travel insurance offers a year long coverage and unlimited trips based on their classification of countries. Not forgetting that if you were to purchase individual single trip insurance to various countries, their premium would be different as well. Need an adviser to help you as you buy travel insurance? Let Comparekaki walk you through it. In the case of MSIG above, their countries are being classified based on region and you will only be given 3 selections to choose from, do yourself a big favour and save plenty of time. This has been a controversial issues to many and instead of probing their insurers or doing the math, most policyholders would typically just turn to single trip travel insurance if they know that they do not think that they will travel that often, while annual travel insurance policyholders would take this plan up if they are travelling on a regular basis usually for pre-planned or scheduled business trips. No matter the reason, it is always wise to do the math and find out the difference to see if it really is worth it at all. If you have a scheduled set of countries where you know that you will be travelling to, simply categorise them and check against the countries where the insurers are covering and select based on the region and you are good to go. For this case, if we were to use Thailand as a reference country, each single trip travel insurance premium is priced at $17. 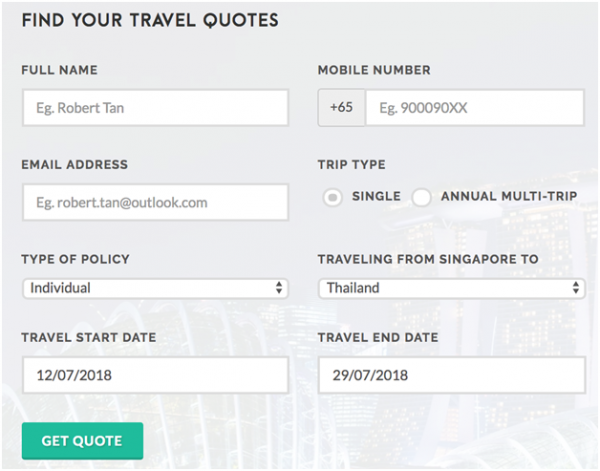 As Thailand is under the ASEAN region, the annual travel insurance from Etiqa is priced at $133, hence if you were to do a simply division ($133 / $17 = 7.8 ≈ 8) you would need to travel to Thailand at more than 8 times to make your premium worth. If you foresee yourself travelling to a specific country or countries which are under specify regions you should consider an annual travel insurance as it is much cost effective this way. If you do not see yourself travelling as often as 8 times to Thailand or any other countries under the ASEAN region in this case, it would make better financial sense to get the single trip travel insurance instead. 'Kaki' is a Malay word meaning 'leg or walk'. It is also Singlish referring to 'buddy or partner'.At CompareKaki, we want to be your 'Compare Buddy' to empower you to compare Car and Travel insurance quotations online. Let us do the 'legwork' so that you can compare for the best deal that will suit your needs. In addition, we will be your buddy for any claims assistance.CompareKaki is managed by SingCapital Pte Ltd, MAS licensed Financial Adviser.